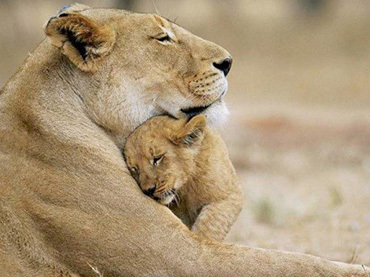 Sometimes, animals act more humanely than man. Sometimes, we have a tendency to choose are friends not for who they are but for what they are. We can’t look past other people’s race, color, and even their disabilities. 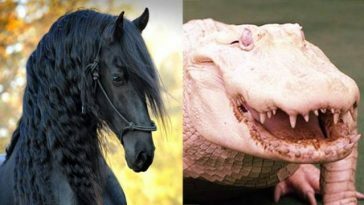 But these animals will show us what friendship really is all about. 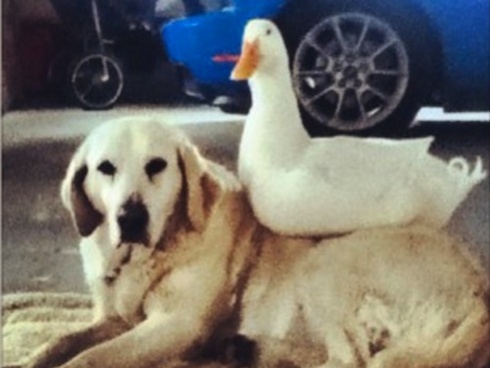 These animals demonstrate that friendships is not ‘What’ we are but ‘Who’ we are is really all that matters. 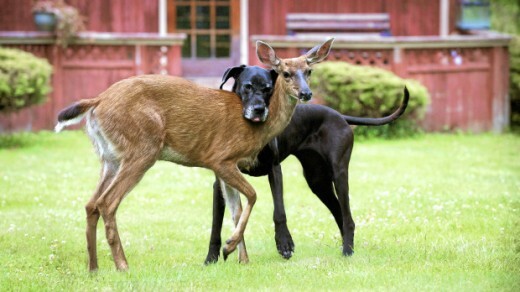 When a helpless fawn in Isobel Springett was abandoned by its mother, the property’s Great Dane, Kate quickly adopted the deer. 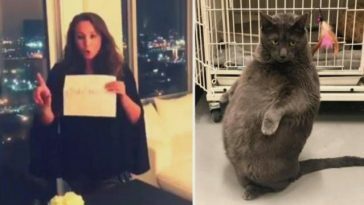 Ever since that they, Pippin and Kate have become best of friends. When a mildly disabled 4-weeks-old lion, Bonedigger, was introduced at the G.W. 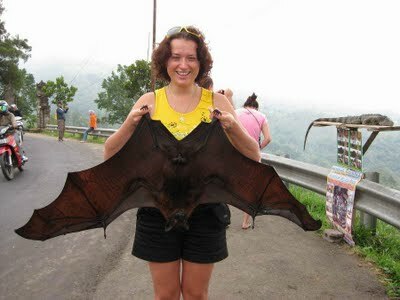 Exotic Animal Park, something unusual happened. 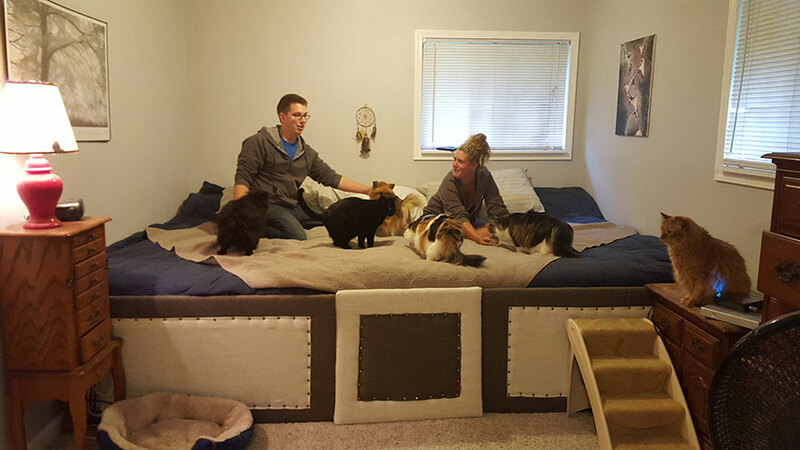 Milo and three other Dachshund puppies instinctively knew that Bonedigger was disabled and they quickly took in the much bigger animal in their group to protect him. 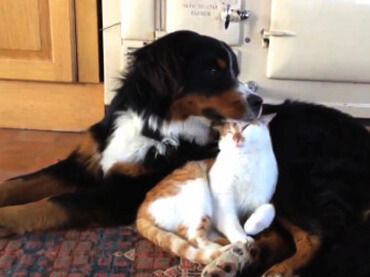 Milo became Bonedigger’s unlikely companion and caretaker. 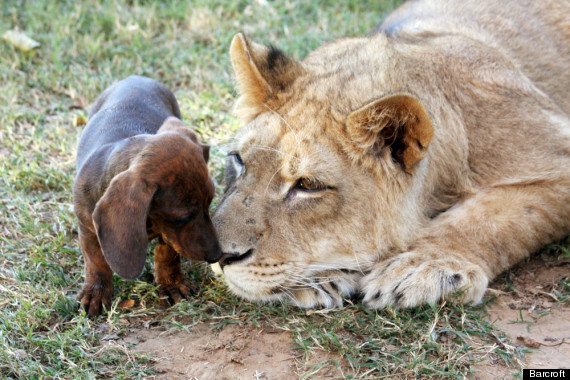 The Dachshund looks after the lion. Milo likes to clean Bonedigger’s teeth and even imitates his roars. A cheetah and a dog would unlikely form a friendship. 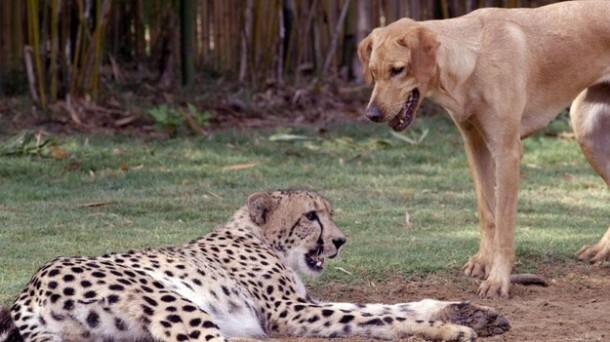 But, a cheetah named Kasi and a labrador named Mtani are friends like no other. The cat and the dog were brought to the Jacksonville Zoo when they were babies. 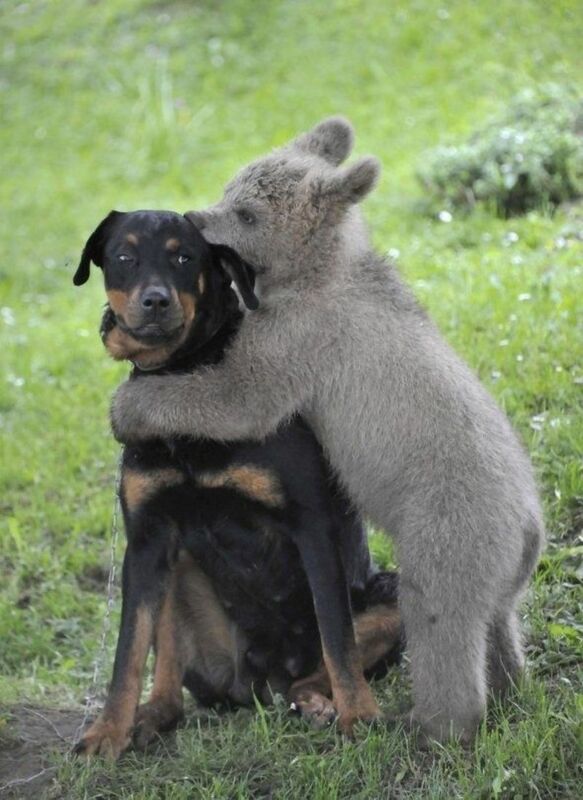 These two different species grew up together and became fast friends. 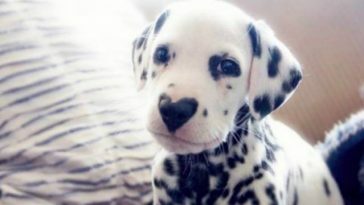 The animals shared the love for running after things.. 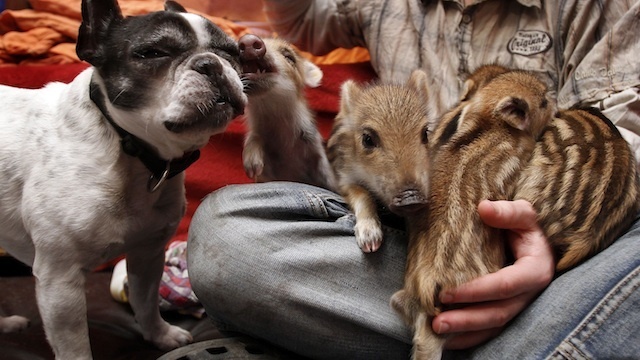 Abandoned near the Berlin forests, six baby boar piglets found an unlikely foster mother. Baby, the French bulldog, quickly stood as the boars’ surrogate mother. 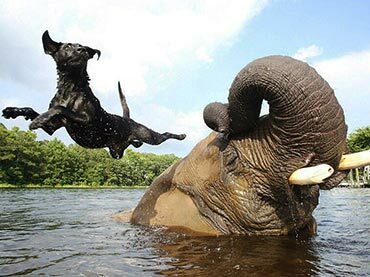 Finding common ground in their love for water, Bella the Labrador Retriever and Bubbles the elephant became unlikely friends. Bella loves to climb on Bubbles’ back and dive back into the water. Medo a 3.5 months old bear cub wandered onto the Logar’s farm in Slovenia. 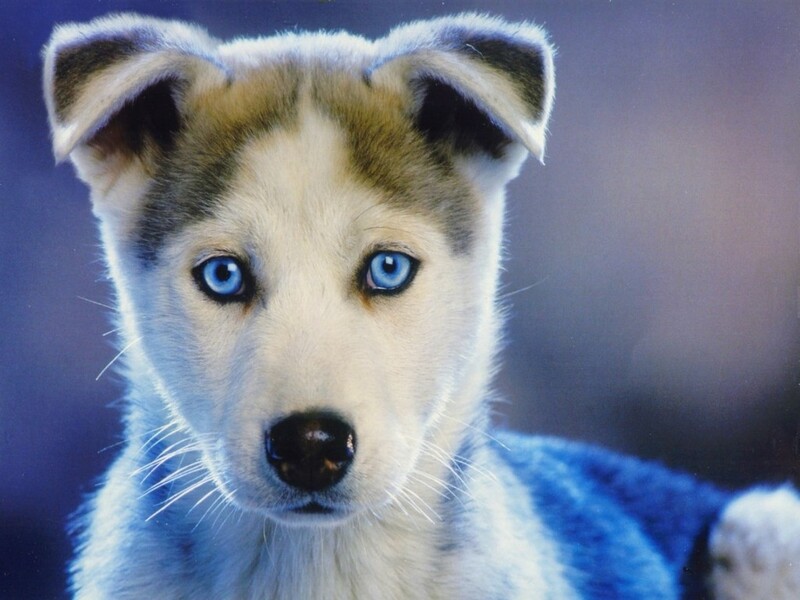 The Logar’s dog, Aijka, quickly befriended the lost cub. For now, Medo or Lucky is still under Logar’s custody but the brown bear cub will have to transferred to a wildlife refuge sometime in the future. No, Medo still enjoys the friendship he has with Aijka. 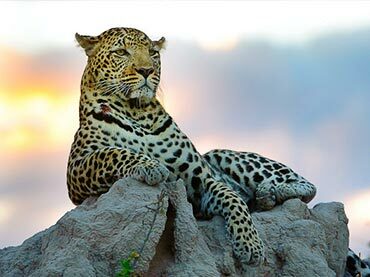 At Akwaaba Lodge in South Africa, a jaguar can be found playing with a dog. Jag the Jaguar was quite young when introduce in the animal refuge and the young feline needed a companion. Bullet the Jack Russell Terrier came to the rescue. 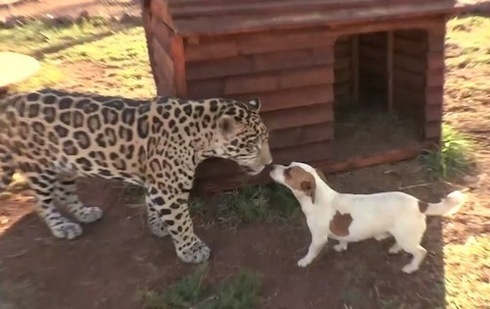 The dog took care of the young jaguar but as the jaguar grew up, he needed to be place in his own enclosure. It was a disaster as Jag kept on crying for 24 hours and Bullet refused to move, so the zoo caregiver reunited the tow. 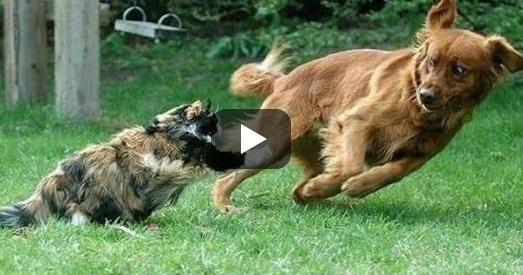 Now, the feline and the canine are found playing with each other like brothers in the zoo. 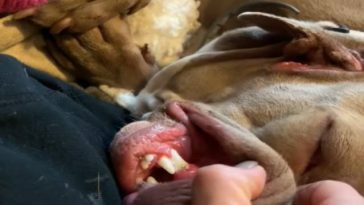 When a zoo keeper was taking and orangutan named Suryia and an elephant to a beach in Myrtle Beach Safari, they saw an old dog. 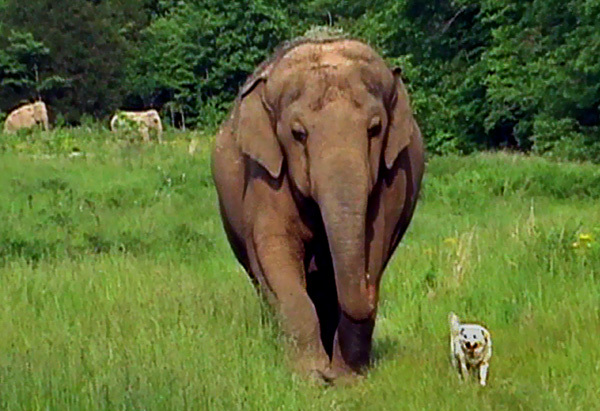 The old dog quickly ran towards the newcomers and Suryia quickly jumped off the elephant to go towards the dog. The two animals hugged each other like they have known each other for years. The zoo keeper tried to look for Roscoe’s owners but nobody claimed him except Suryia. 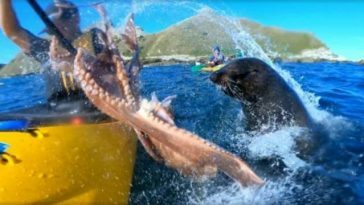 Now, the two are frequently seen playing with each other and swimming together. 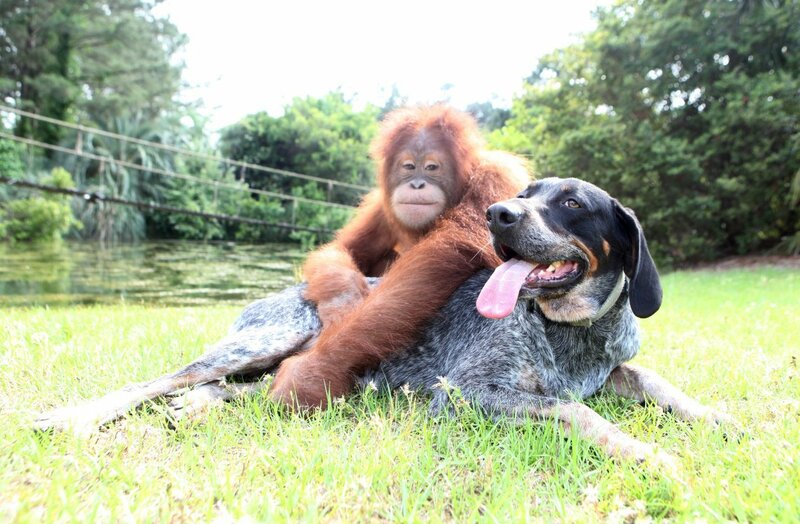 Roscoe, the abandoned dog has finally found a family in Suryia the orangutan. While out with his owner, photographer Torgeir Berge, Tinni a dog ran across a baby fox. The dog and the fox quickly became friends. The fox is now answer to the name Sniffer. 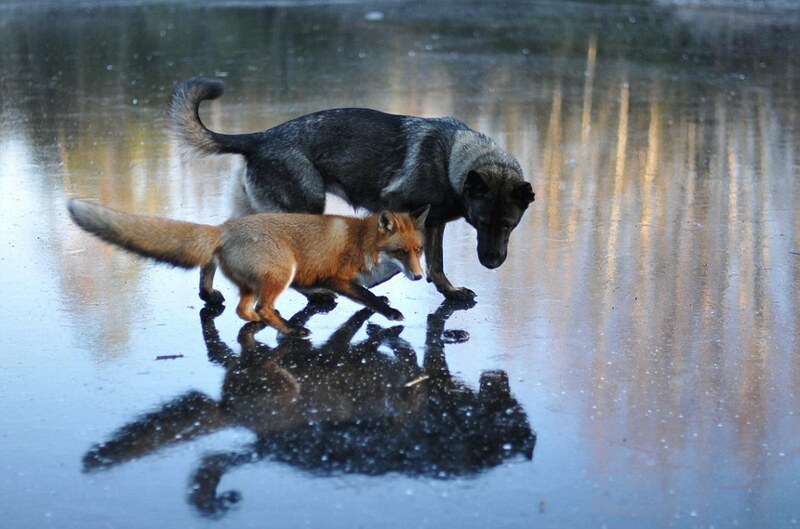 The dog and the fox are regularly seen playing with each other. A family in Australia found an injured Australian Magpie chick. Taking pity to the bird, the family fed and healed the bird until it was ready to be released in the wild. 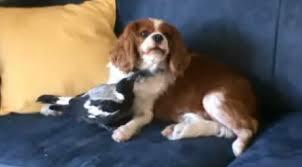 But, the Magpie formed an unlikely friendship with the family’s Cavalier King Charles Spaniel. So, the Magpie would visit the family twice or thrice every day to play with his dog best friend. 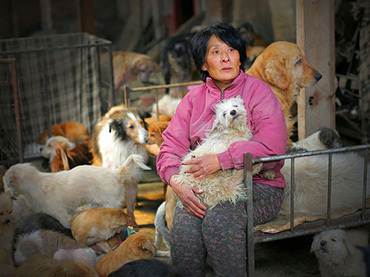 When Frances Marsh bought two ducklings, she never thought that they would instantly bond with her dog, Yogi. The ducks quickly thought that Yogi is their mom and the Corgi thinks that the ducks are his children. 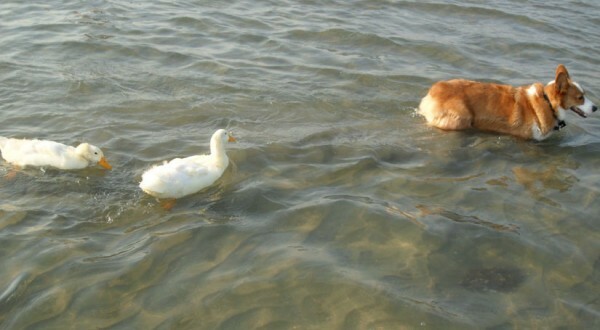 The ducks follows the Corgi around and depend on the dog for cues and guidance while the dog herds the ducks gently and protect them from harm. Sharing spaghetti “Lady and the Tramp” style but the Lady in this story is Queenie the cockatoo. 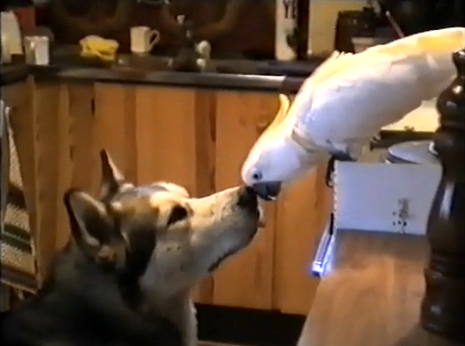 The bird and the dog are best friends. Eating is their favorite bonding activity. Queenie usually feeds Kenzie and they look so cute. Tarra an elephant adopted a dog who wandered onto Elephant Sanctuary. For 8 years now, the two are inseparable friends. They eat and sleep together in the same barn. 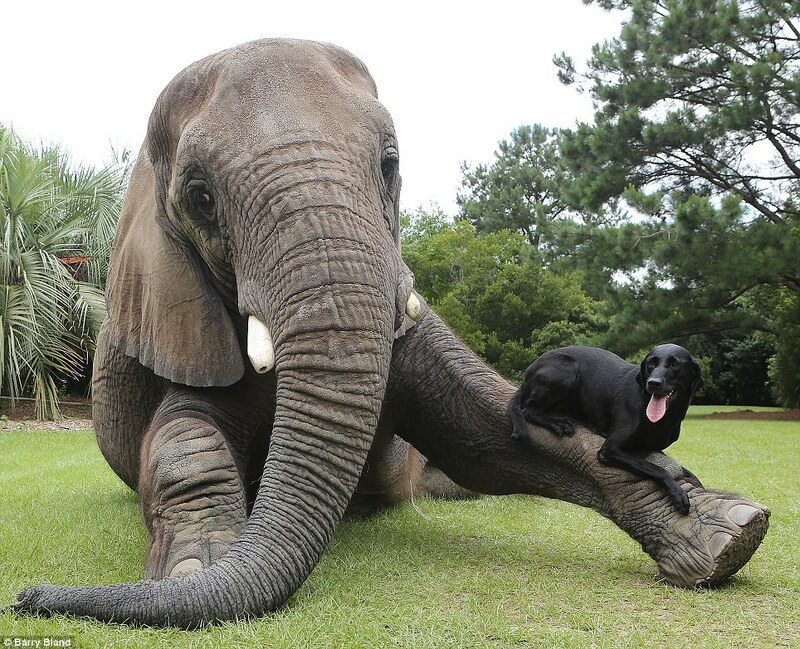 Bella the dog trusts the Asian elephant completely. 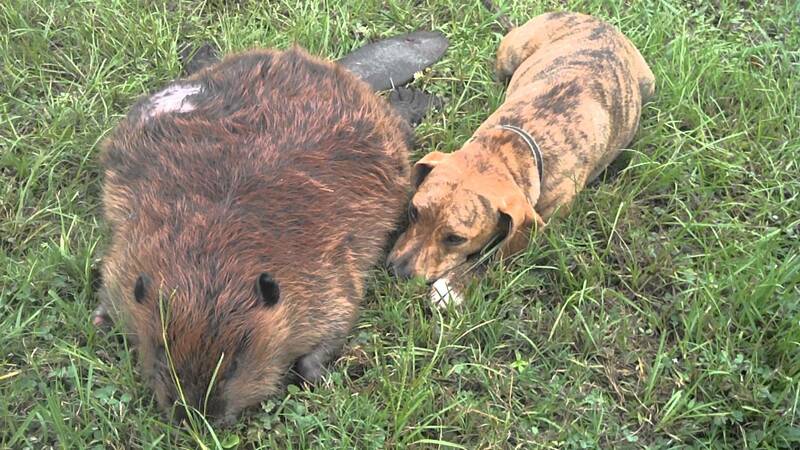 Bella the dog has been living with her best friend Beavis the beaver for quite sometime. 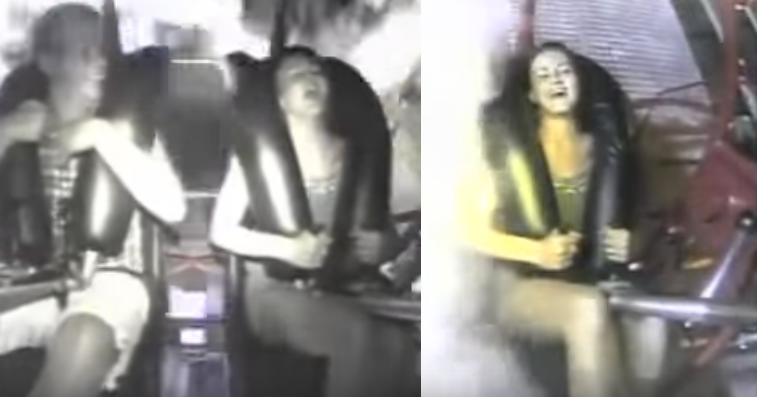 They would always play with each other. 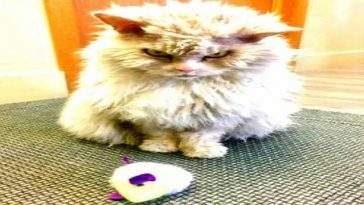 So, when Beavis passed away, Bella mourned for her friend like a best friend should.